About 18 months ago I took a few weeks to letter, illustrate and illuminate in a small book form "A Visit from St. Nicholas" by Clement C Moore. I worked on 2 full sheets of calf vellum and painted in gouache, watercolor and used 23K gold. I sent my finished pages to John Greenawalt of The Book Arts Conservatory in Washington DC where he and his partner, Stephen Vanilio (www.bookarts.us) create the most amazing handcrafted book bindings and presentation boxes. To our amazement they sold the small book within 15 minutes of it being offered for sale. The gentleman who purchased the book is a key figure in the preservation of the Ford's Theatre in Washington DC and that led to the creation of Lincoln's Gettysburg Address to be presented to President and Mrs. Obama on Wednesday, February 11, 2009 for the gala celebration of the rededication of Ford's Theatre in honor of the 200th anniversary of the birth of Abraham Lincoln. The artwork was created on a piece of calf vellum 16 by 22 inches in size. It was then slipped into a tooled leather folder which was then placed in a tooled leather clam shell box made by Book Arts. 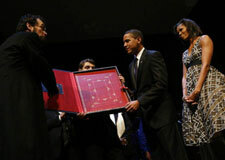 The Gettysburg Address illuminated on calf vellum, presented to President Barack Obama on the occasion of the re-dedication of Fords Theatre in Washington DC on Feb. 11, 2009. Are you looking for an award that is uniquely designed for your event? 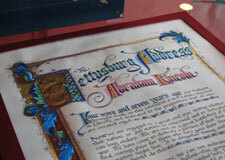 Rosemary’s style of combining beautiful lettering with watercolor designs and illumination will provide just that. Awards can be designed to be printed and then filled in if they are repeated on a regular time frame. View the samples below and then call us to discuss your next award. 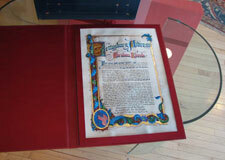 These award and commemorative books are for the truly distinguished one-of-a-kind presentation. All of these books are beautifully leather bound and can be presented in a “clam shell” box lined with marbled paper. These books can also be put into a digital format for viewing. 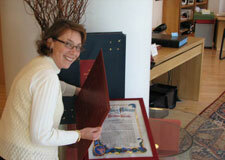 Please contact us to discuss your next commemorative event. These gifts were created for those special times when a memorable gift was called for. All of these pieces were designed for gifts, events or with a special purpose in mind. Contact us and we will work with you to produce whatever you require. Please contact us for prices and options such as custom matting and framing.